We successfully completed our Flood Relief Campaign, “Spirit of Compassion” on August 31, 2015 under the umbrella of our Corporate Social Responsibility Program SEED (Social, Environmental and Educational Development Programme) by collecting over Rs. 4.0 Million under this initiative. 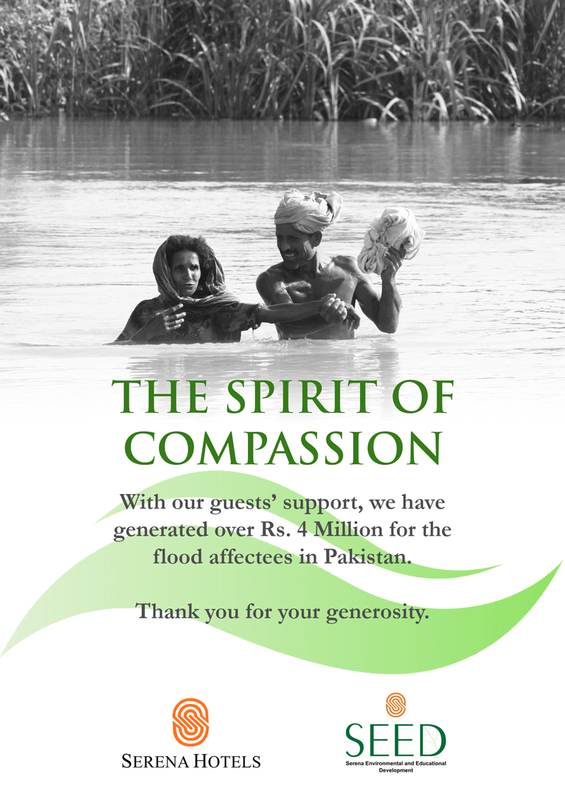 Serena Hotels, collected from their guests 5% of the restaurant bill and contributed 200% of the guests’ contribution towards the flood affectees in various parts of Pakistan. “We are humbled and grateful for the generous participation of our guests in this effort. Insha’Allah, these funds will go some ways in providing much needed relief to the affected areas.” said Corporate Strategy Director, Dr. Moin Uddin. The monsoon rains have decreased through various regions in Pakistan as August comes to a close, allowing for authorities to focus on rehabilitation efforts across the country. This entry was posted on September 8, 2015 by Serena Hotels in Uncategorized.